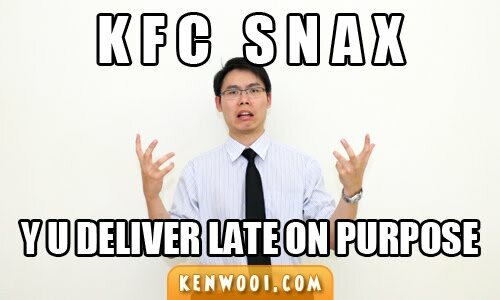 KFC SNAX, Y U LATE ON PURPOSE? I’ve been having this KFC SNAX Card for quite some time. Probably got it when it was first launched by KFC. Well, I don’t usually dine at KFC, but when I do – I will get the card swiped to collect the KFC SNAX Points. Everyone loves getting points out of buying stuff right? 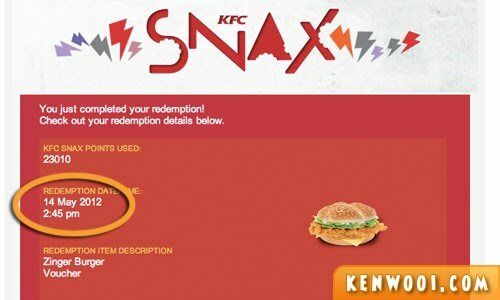 And with the accumulated SNAX points, KFC food can be redeemed from the KFC SNAX website. Without hesitation, I redeemed a Zinger Burger voucher with 23010 points. The confirmation email came and according to the footnote, it is stated that the redeemed item will be delivered within 14 workings days – which is almost 3 full weeks. Fine, I waited patiently. I even calculated the estimated arrival – on May 31 – exactly 14 working days. But it didn’t. June came along, and it was finally delivered on June 12 – that’s 22 working days to be exact (or almost 1 month). Actually, I didn’t mind the delay – as long as the Zinger Burger voucher reaches my hands safely. Take note of the letter’s date, and the “We’re truly sorry for the late delivery” introductory line. It seems like the late delivery was an unavoidable one. 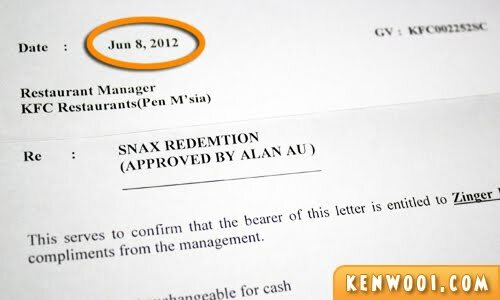 It immediately struck me – KFC Snax Squad prepared their official letter on May 24, indicating that the delivery is late. BUT then the voucher is dated on June 8. Furthermore, there’s a 11 working days gap between May 24 and June 8. If the voucher is dated May 25 then understandable lah. 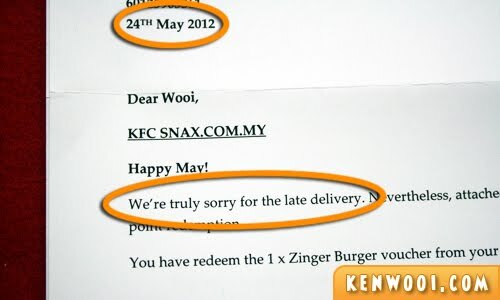 But 11 days of delay, KFC knows they’re delivering it late, and… they’re truly sorry? KFC, you know what – perhaps that’s why McDonald’s is doing so much better than you. McDonald’s delivery can reach my doorstep within 1 hour – FOOD within 1 hour, and you need 14 working days (22, actually) to deliver a piece of paper. How can?! Pfftt! But at the meantime, KFC, I’m gonna enjoy my McD meal. KFC – Ken Faster, Can? 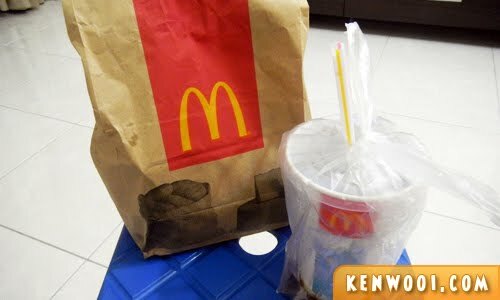 mcd can even deliver mcflurry before it becomes liquid! 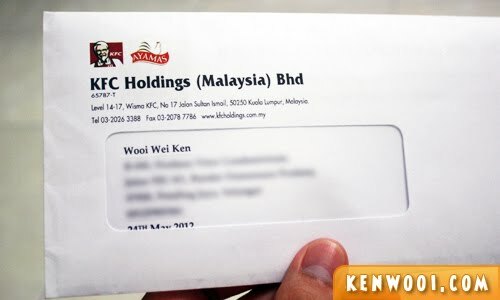 hahaha… that’s prove how ‘efficient’ people working in KFC lor… sama sama jenis.. I didn’t get this card.. cause I always think that I will not go KFC but end up I visit quite a lot too. Like that also can ah???? KFC Fail!!! And did you know about the free chicken if exceed 60 seconds thing? They just can’t implement it cos they will end up giving out so many free chickens they will go bankrupt. LOL! well, i guess that’s the KFC culture >_<"
lol…well kfc never been my favor..
You go redeem your burger got kena pukul kah? Just kidding lah. Hahaha.. I guess Malaysia KFC need to improve their services lor. Got such thing one kah? I don’t even know of this point system..
M definitely better than K! Ada kah kfc snax card tidah terima lagi ? 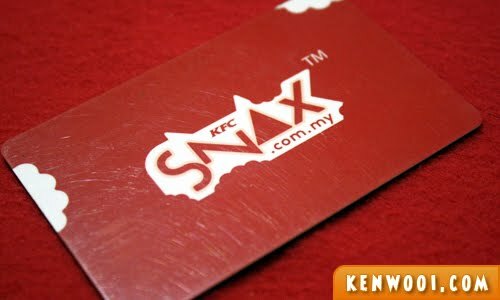 The KFC SNAX Card is no longer valid, as announced by the KFC Management.